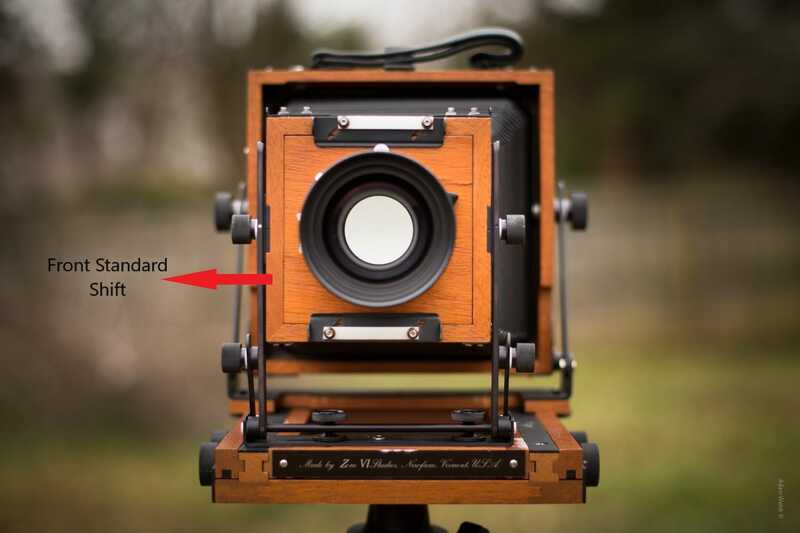 What is “large format” photography? 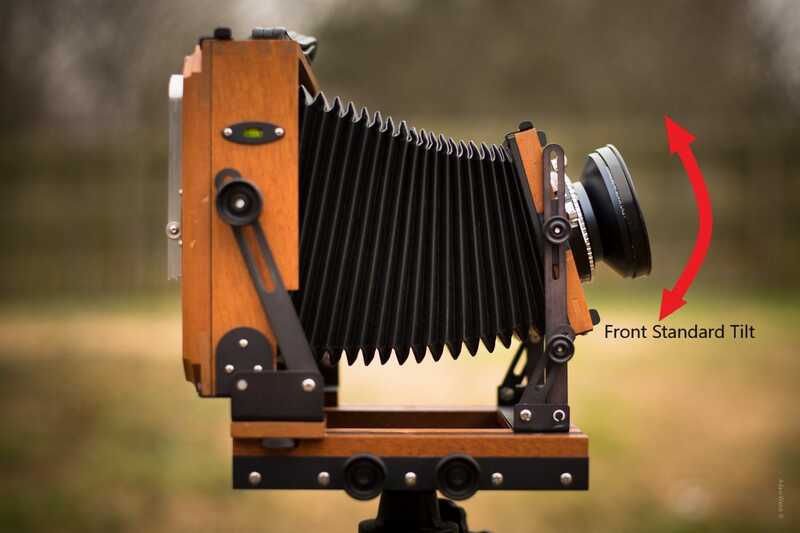 When we talk about large format we are usually referring to film photography*, and more specifically, any film photography work that uses a negative of 4×5 inches or larger. In truth, large format photo work extends far into other imaging modalities beyond that of film… but that’s for another article. 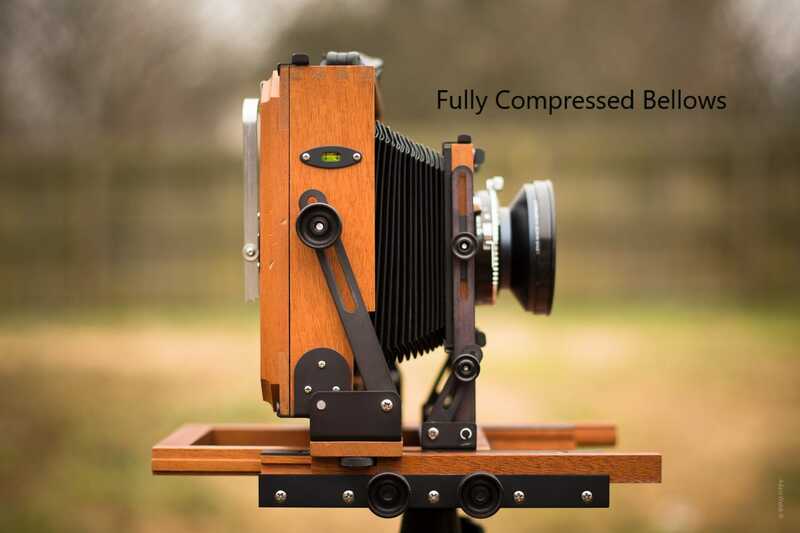 Large format film photography is essentially those “old timey” looking cameras that appear a little bit like accordions and seem to be very complicated to use. 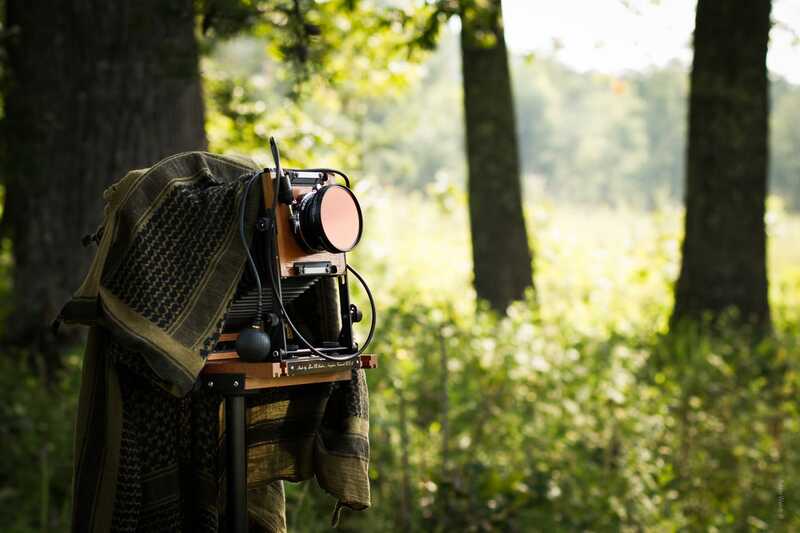 In reality, these accordion-esque large format cameras are quite simple to operate once you know a few basic concepts. And the images the produce still easily outclass even the most modern digital cameras in terms of tonal range and sharpness. 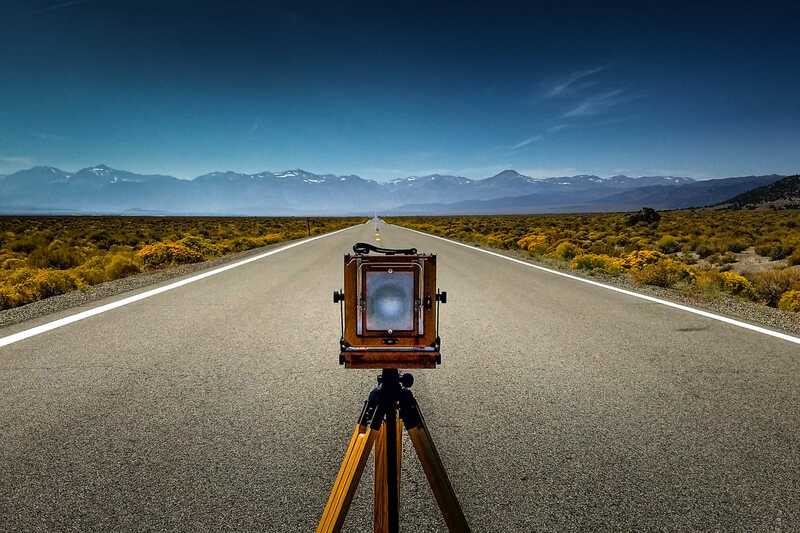 What does large format photography offer to us photographers? After all, we live in a brave new digital world of photography where sensor size wars rage even at this very moment. Why would anyone want to go through the trouble to work with large format photography instead of digital? We’re going to look at exactly how and why the answer to that question is something that isn’t well… answerable in the mainstream sort of way. It all comes down to your intentions(more on that at the end.) In the meantime we’re going to talk about the basic parts of large format cameras and show you how they make photos. 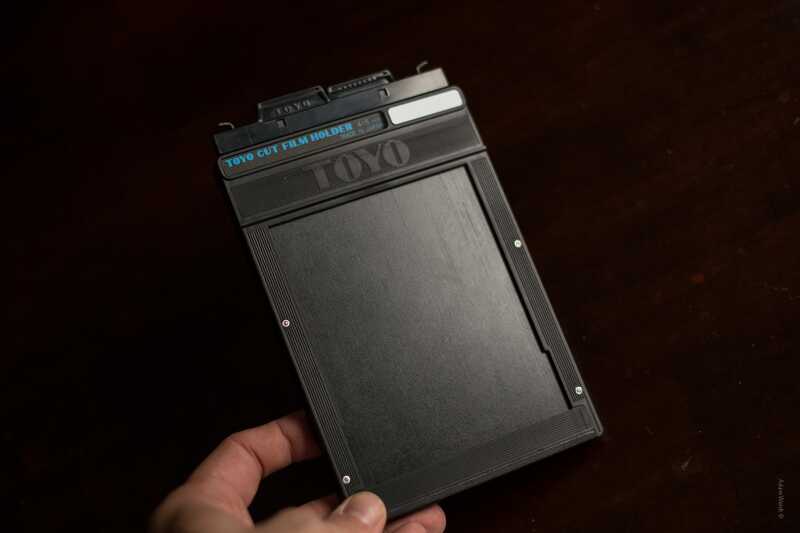 Get ready to go back to the future of photography. *The manner in which the image is recorded also varies greatly but for the purpose of this lesson we will only look at large format film. There are other types and processes of large format photography such as wet plate and even digital that are also equally incredible. 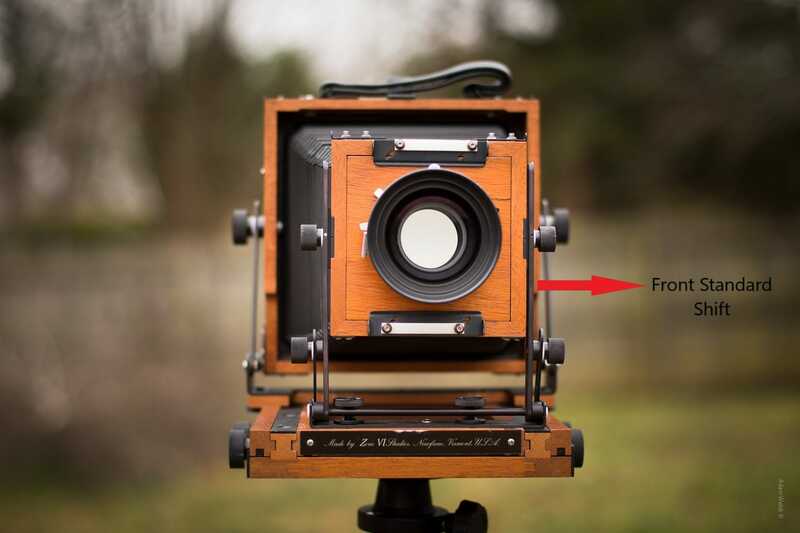 The first thing to understand about large format photography is that the principles are exactly the same as any other form of photography; you have a lens mounted to a light-proof housing (except for pinhole photography), and an image receptor to record the focused image. 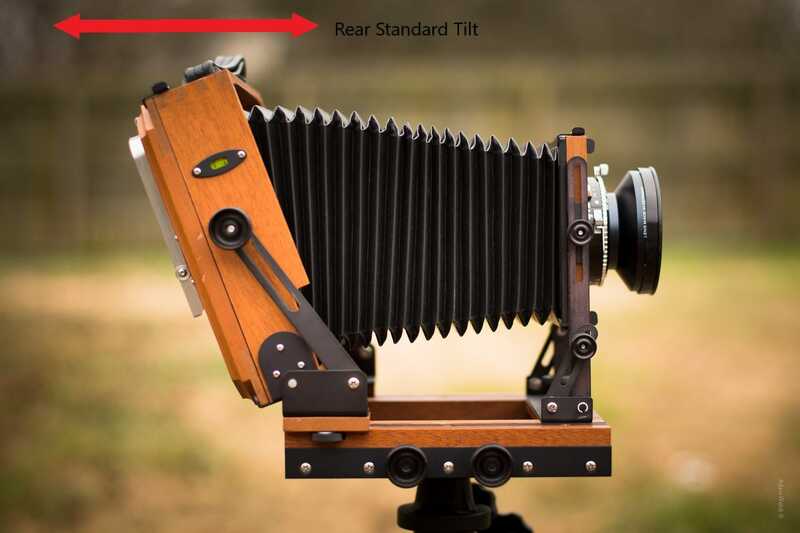 A key difference between large format photography and conventional digital or even film photography is the amount of “movements” which are possible with may large format cameras. 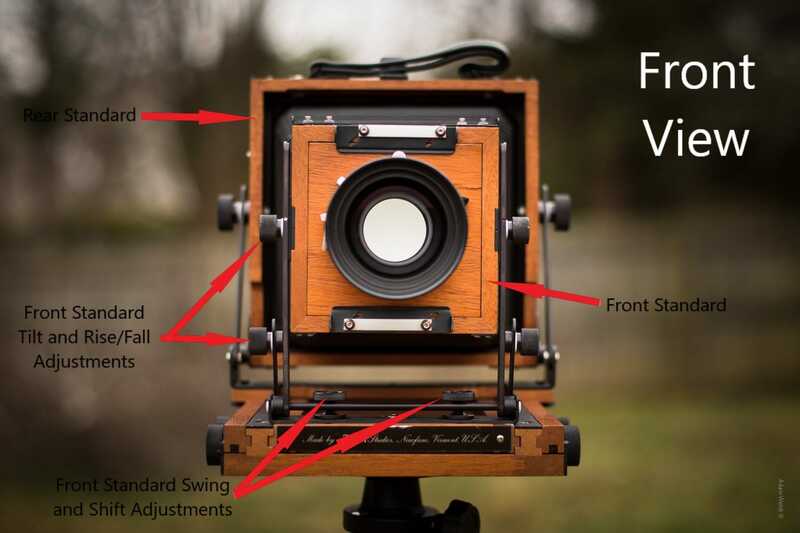 While there is a lot of variance between one large format camera to another there are some basic parts and components that can be found of the majority of these large format beauties. The rear standard is the back portion of the camera. Movements made to the rear standard control the perspective of the final image. That is, the minimization and enlargement of the background and foreground. 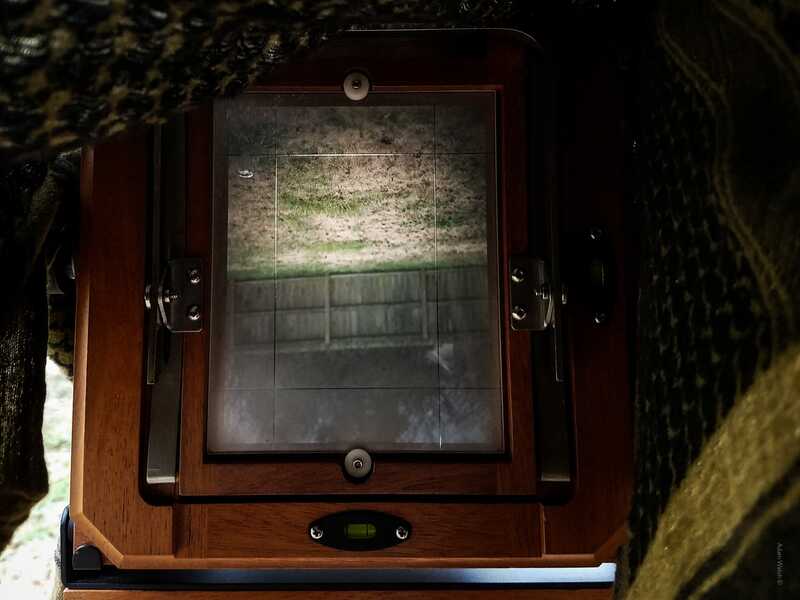 Here is where you will view your image on the ground glass. 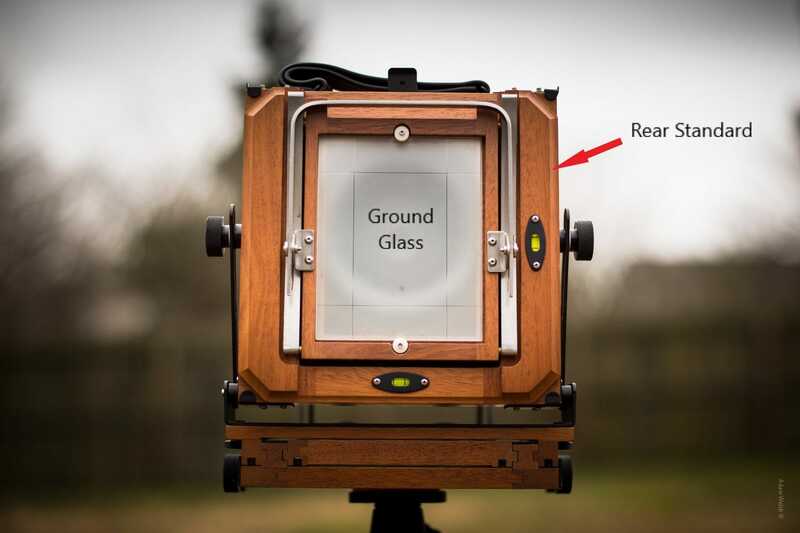 The ground glass is a translucent plate where the incoming light from the lens is focused and composed prior to inserting the film holder. 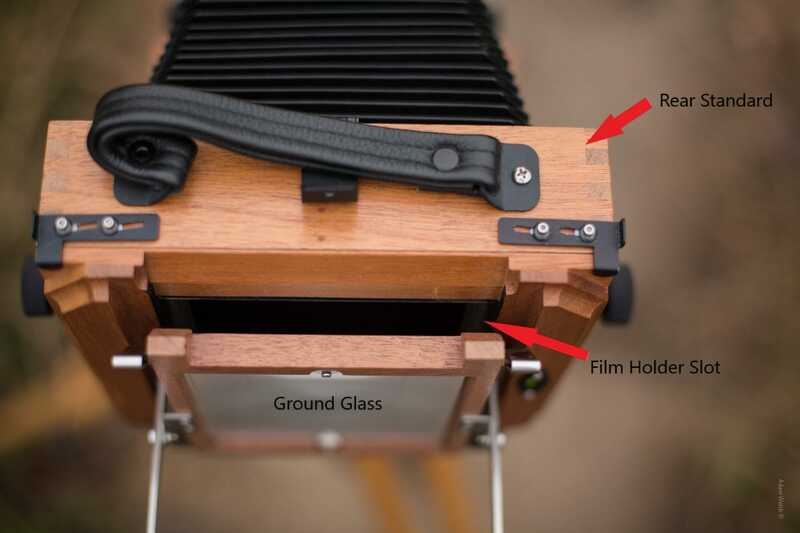 The film holder is inserted in front of the ground glass and held in place via friction or spring compression. Depending on your camera, the rear standard is capable of a variety of movements. This includes, tilt, swing, and rise/fall. 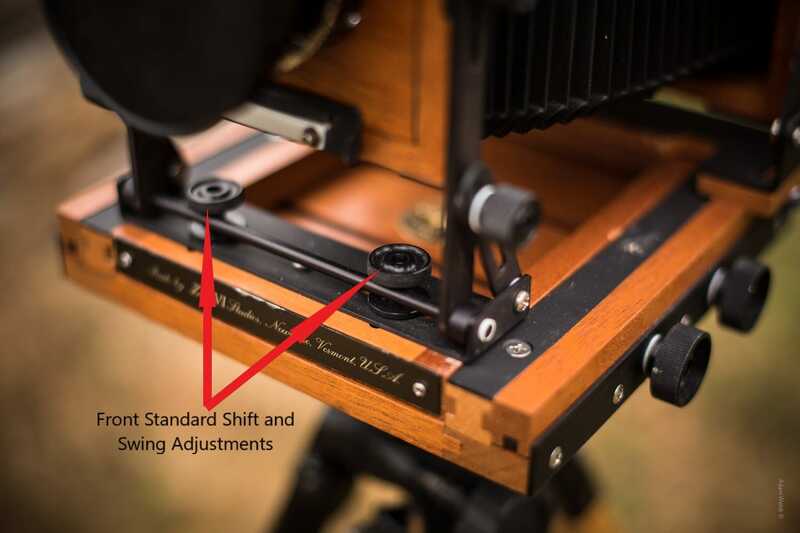 With some large format cameras the rear standard is also capable of shift movements as well as rise and fall. My particular camera, a Zone VI 4×5, does not have these movements in the rear standard. Don’t worry, all of these movements will be covered a little later in the article. 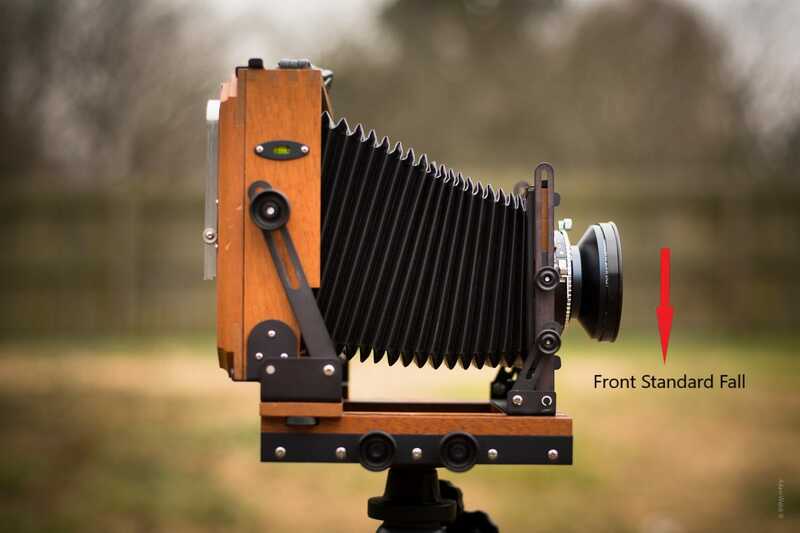 As you’ve probably guessed, the front standard is the front portion of the camera. 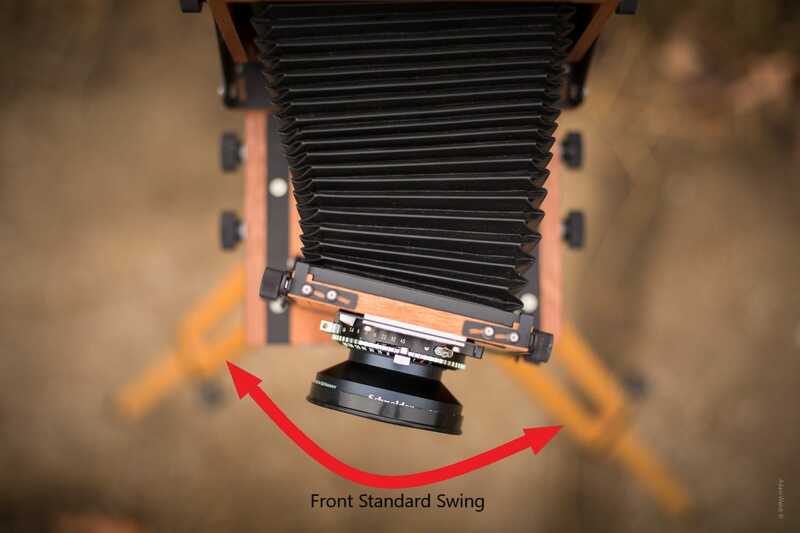 The front standard is where the lens is mounted to the camera and is responsible for the majority of the movements that affect the focus of your final photograph. The accordion. 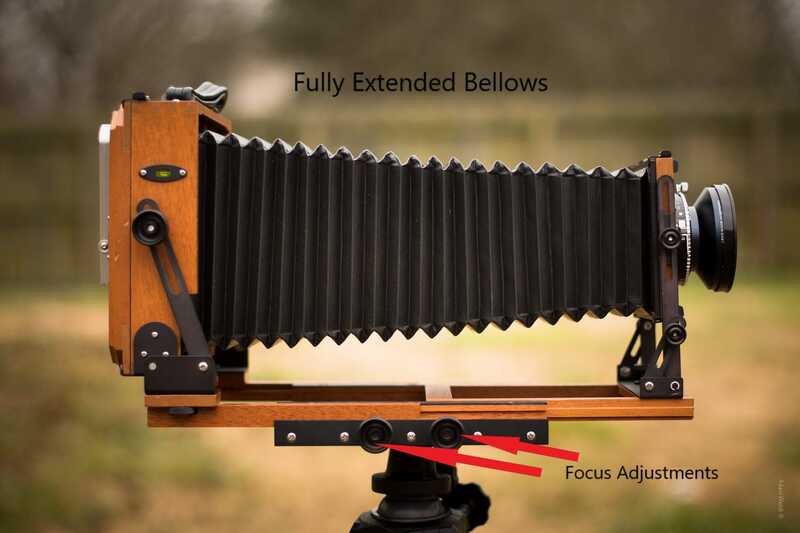 The bellows are one of the hallmarks of large format cameras and what makes them so recognizable. Bellows function as a light-proof point of flex between the front and rear standards. They allow for complex movements and focusing between the lens and the ground glass. We’ve all seen those photographs where everything looks as if it’s miniaturized. This is accomplished by tilt/shift focus manipulation. This was born from large format photography. A tilt movement is when the front or rear standard is literally tilted either forward or backward. Here we see front standard tilt. 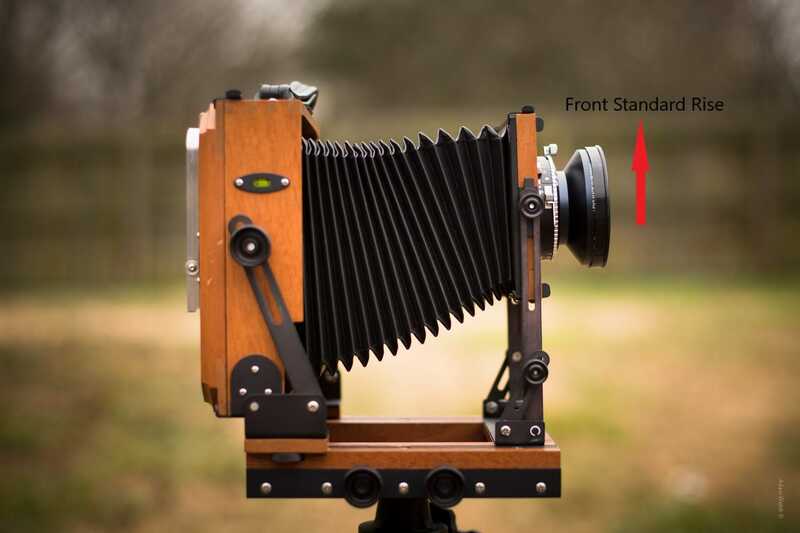 Front tilt affects the focusing of the foreground or background in it’s vertical relation to the film. Rear tilt controls how the light interacts with the film thusly vertically enlarging or shrinking the relative perspective of the foreground or background. A swing movement is a close cousin to tilt. The difference is that swing affects the horizontal lines of the image instead of the vertical. 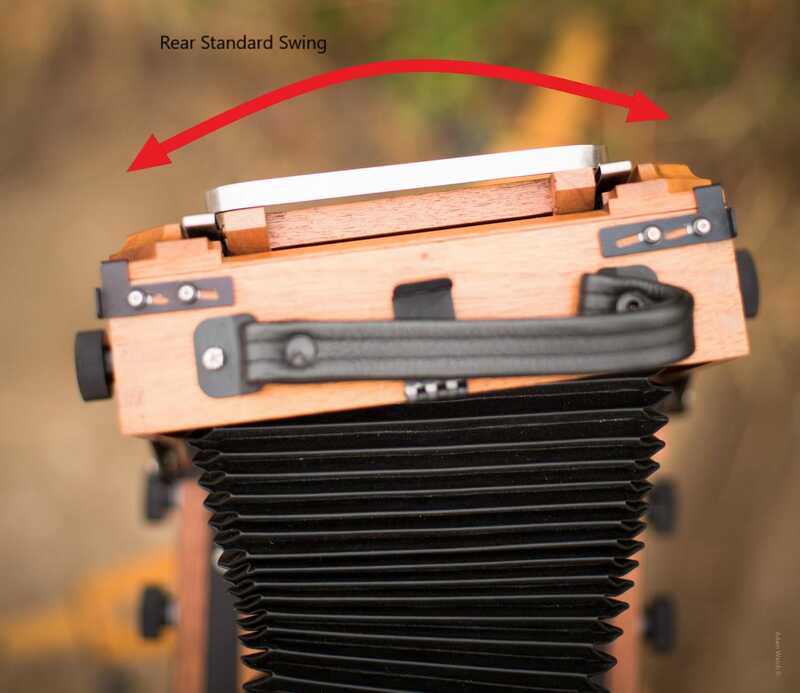 Remember, the rear standard of my Zone VI 4×5 is capable of swing movements but not all large format cameras have this option. Unlike swing and tilt, shift movements do not affect focusing or perspective. Shifting either the front or rear standards essentially moves the image left or right in the frame. This is hand for adjusting the horizontal composition without repositioning of the entire camera. Just as with the rear swings, not all cameras will be able to perform rear standard shifts. My camera coincidentally cannot. Rear shifts, however, operate in principle exactly as front shifts. This is exactly the same as shift but this time we are moving the frame up and down instead of left to right. This is a great way to adjust the composition vertically without physically changing the elevation of the camera. 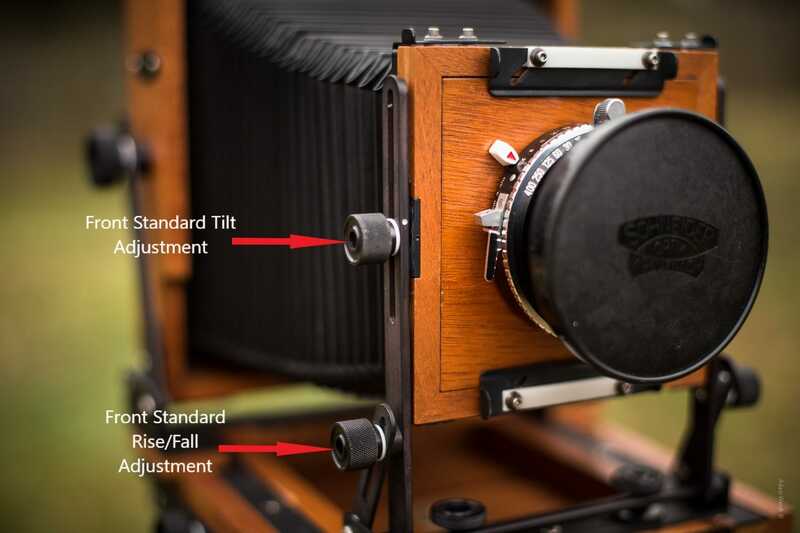 Just as with shift, my particular camera doesn’t have rear standard rise/fall. The way film is loaded into large format cameras is at once incredibly straightforward while at the same time incredibly nuanced. Photographic film of any type consists of a base layer and a photosensitive emulsion. 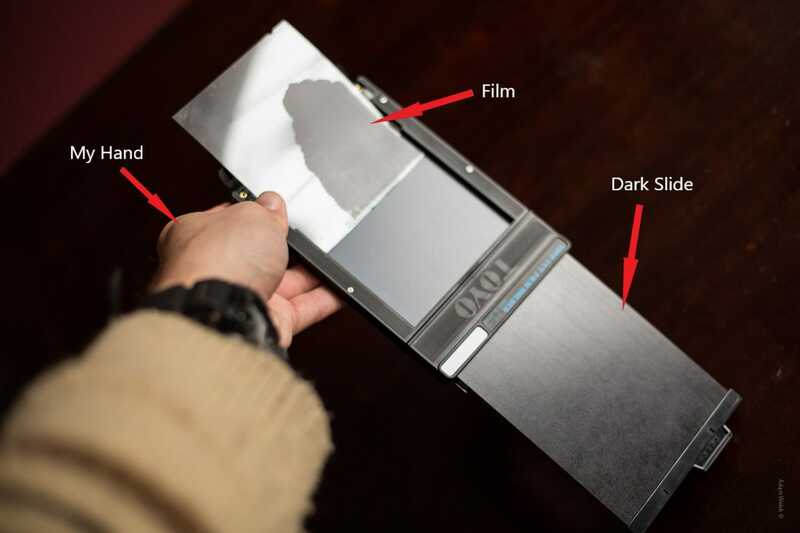 The emulsion is what makes the film sensitive to light and therefor records the image. 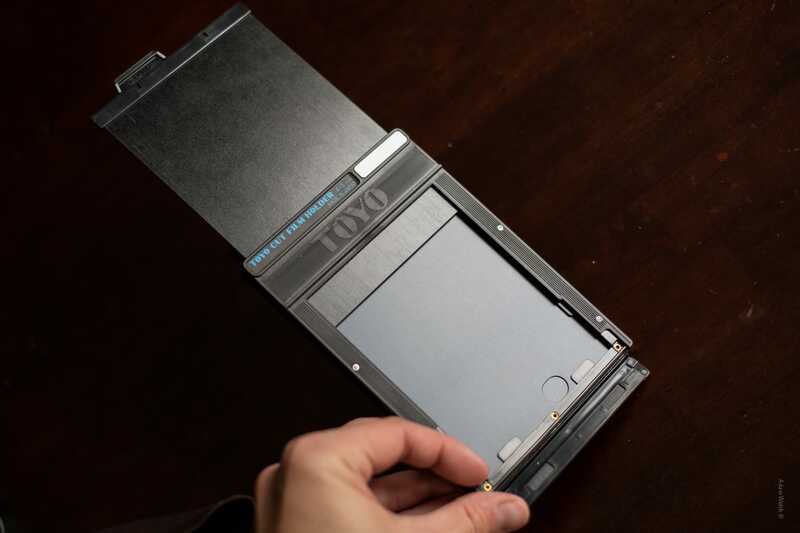 The film is loaded into this, a film holder with the emulsion side facing outward so that it will be positioned towards the lens when it’s loaded into the camera. Large format sheet film holders are generally identical in terms of design but vary in size respective to the film they hold. 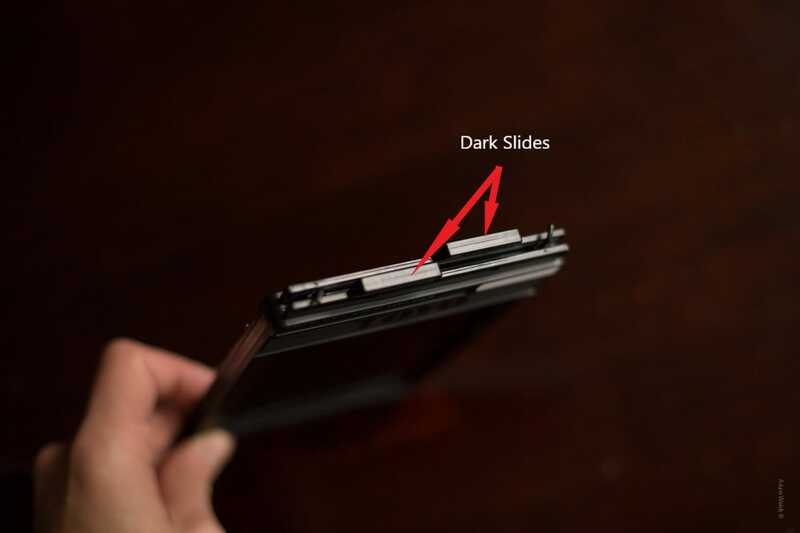 The film holder consists of a holder and one or two dark slides. Then the film is loaded (emulsion out) into the holder. In this picture I’ve used a sheet of 4×5 film that was damaged during processing. Never load your holder in the light! The dark slide is replaced and the holder is now ready to go out into the world and make photos. Oh, and did I mention this whole loading process usually must be done by feel in complete darkness? Honestly, with practice it becomes quite easy to do so don’t let this intimidate you. I know what you’re thinking. Why would someone work with large format photography instead of digital or even smaller format film like 35mm? Well, to understand the answer to that, you might have to change your way of thinking about photography. It goes back to what I said at the beginning of this article about how some questions don’t have a definitive answer. Instead, it all depends on your specific direction of intent. What are you photographing and why? What are your goals? Large format imaging offers so many benefits such as ultimate resolution and eligibility, incredible camera manipulations, and an outlet to express your photographic craft. On the other hand, working with large format means that there are multiple additional steps in the process that leads towards a final image to share with your viewer. First and foremost, each shot will cost you money. Whereas digital reshoots are essentially free, shooting film requires the expenditure of a finite medium. You will also have to develop the film you shoot and then finally, if digital output is your goal, scan those developed negatives to your computer. Is it worth it, in my opinion, absolutely. You of course might draw a different conclusion. Which is fine. If you choose to delve into the world of large format you will find the true nature of what photography was and still is to this day: a way of expressing yourself through recordings of light. Now, you have to take the good with the bad. Large format camera work requires a certain diligence to technique, materials, and process. It can be costly in both terms of time and money but it also offers some weirdly incredible benefits both artistically and creatively. Honestly, you can get started in large format photography for less that $500 if you’re smart and patient. It’s not a high price to pay when you look at some of today’s digital camera systems. Unfortunately it’s one of those strange leaps where the certainty only comes after the fact. For me, I still shoot digital (quite a lot) but once I got started with my 4×5 field camera it was the beginning of an unlikely love affair. Hopefully this article will be helpful in deciding whether or not you want to take the same artistic leap as I did.